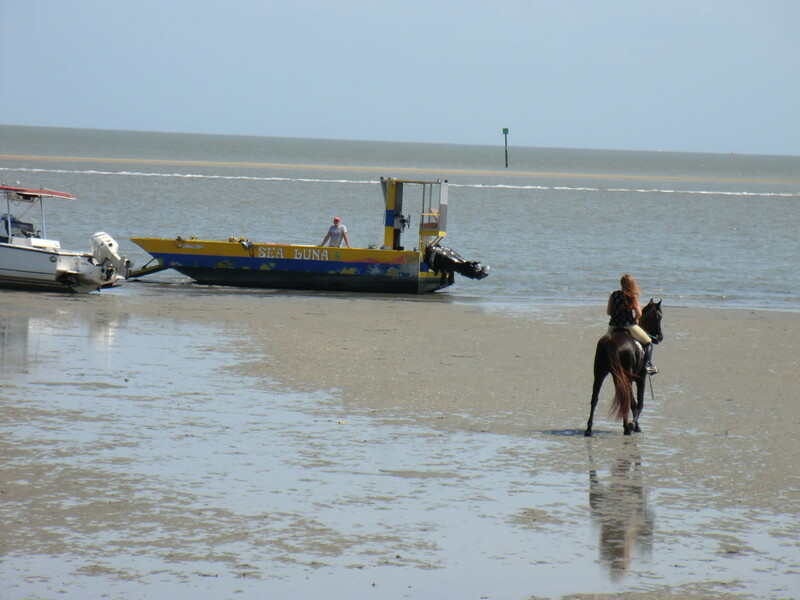 The horses arrive by barge. Most have been here before. 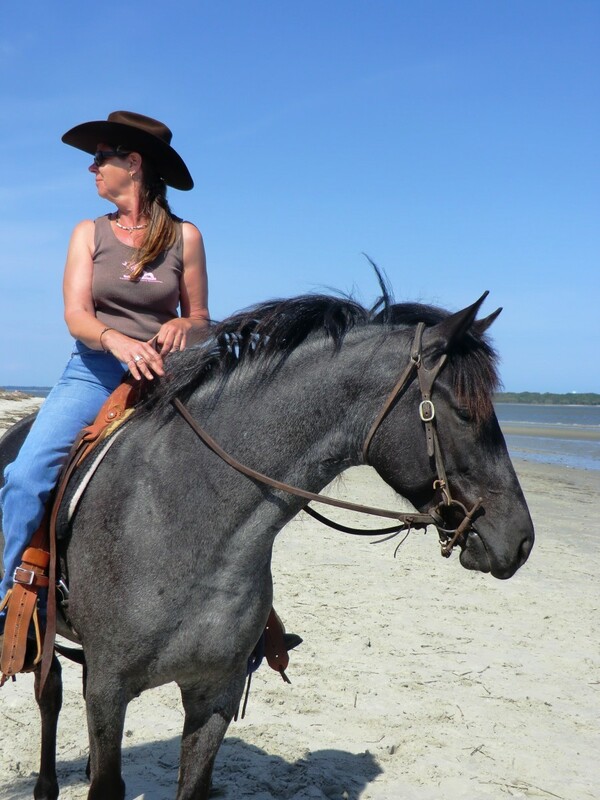 They stay at the Melrose stables, a snazzy joint on Daufuskie Island that houses some handsome looking equine specimens. Daufuskie was once home to freed slaves who had been brought over to work cotton fields and shuck oysters for commercial sale before the waters of the nearby Savannah river became so polluted that the oyster industry shut down and never recuperated. The island is still home to residents of those original freed slaves but they are difficult to find. You have to wander down some long dirt roads far removed from the tourist resort and most work on the island at the private golf courses and resorts. 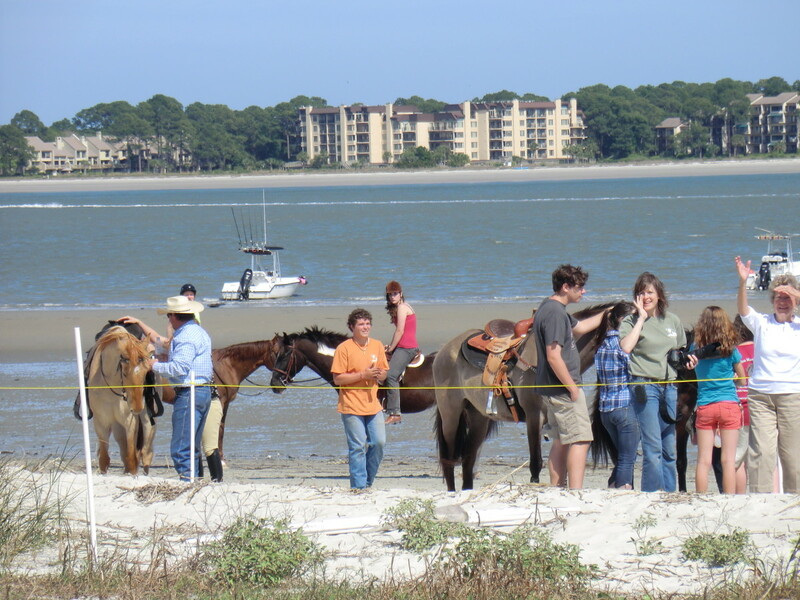 There are probably more visitors than residents on the island today as the Spanish-bred Marsh Tacky horses arrive to race one another along a stretch of beach that looks across the river to the Harbor Town Golf Links, home to the PGA Golf Tour. 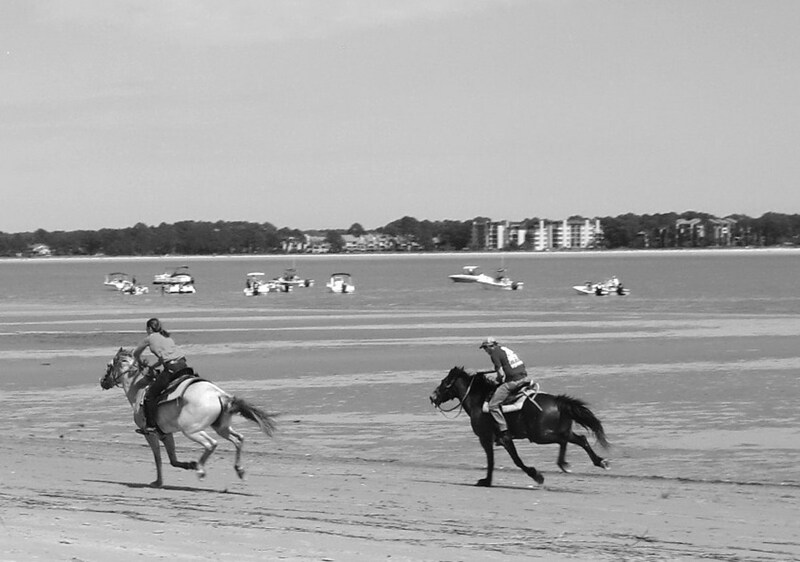 Sailboats, motorboats, pontoons, even kayaks and a barge are gathering as the tide goes out on the powder beige sands of the beach where the horses will soon compete to see who is the fastest. The race is broken into heats where two to three horses race one another; mares against mares, geldings against geldings and stallions against stallions. There are a few thrills and spills as horses spook and saddles break and two girls go tumbling. One is sent to the hospital on the mainland with a broken collar bone, but arrives back in time for the after-party. Another lands on her hip in a spill that has the audience gasping. She limps away grim faced as her horse runs back to the main herd. Marsh Tacky's originally came over with the Spaniards and were small horses, with large hooves and heads relative to their body size. 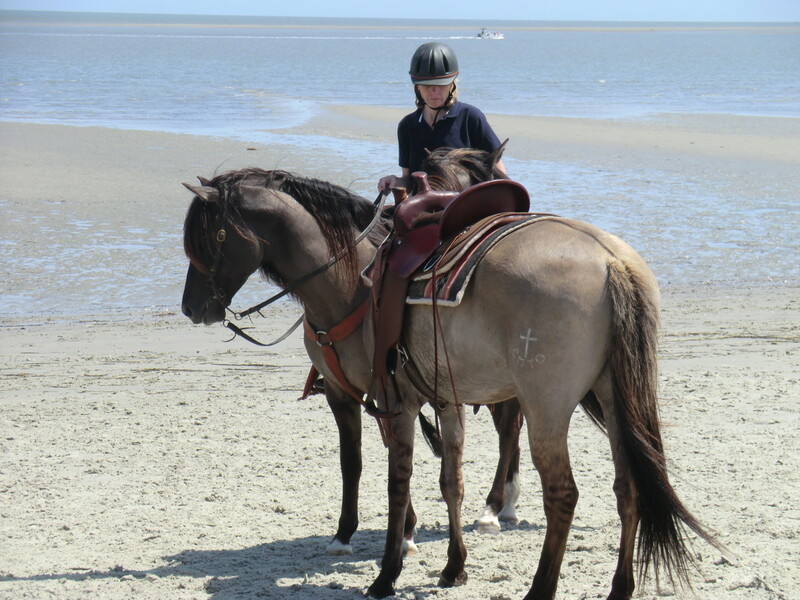 They look like a cross between a Tennessee Walking Horse and a Mustang but these horses at the beach today seem a bit more refined than earlier horses that were largely used as work horses on plantations and often ran feral on barrier islands. The Dafuskie Marsh Tacky Society, located in Bluffton, SC, was formed to preserve the breed which was in danger of disappearing. They have multiple horses at the races today including a dark blue roan or grulla stallion with zebra striping from his hocks to his dark lower legs and a dark dorsal stripe down his smokey blue hide. His mane is thick and dark and his mouth is small. He looks more Mustang than Marsh Tacky and is gorgeous to look at, like a plush stuffed animal they sell at Disneyland. One of his sons is racing today too. 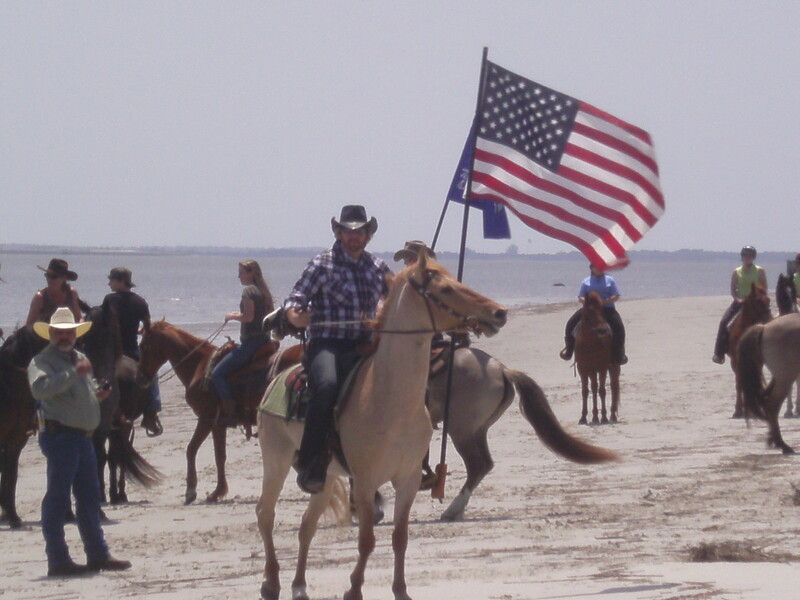 There are a lot of families here and they seem as down-to-earth and friendly as the horses, which allow visitors to pet them as they wait by the sidelines for their turn to race to the opposite end of the beach at record breaking, but hopefully not neck-breaking speed. Some of the horses look like miniature draft horses and are stocky with thick necks, while others have the more typical Marsh Tacky appearance with thin delicate legs, sharp, wide hooves and narrow necks and bodies. 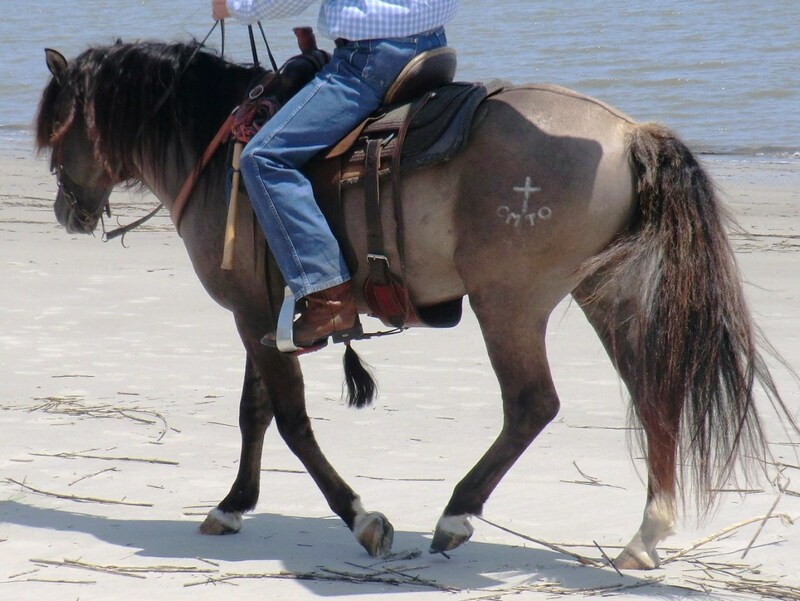 The wide hooves kept the smaller bodied horses from sinking into the marsh mud the way larger horses with smaller horses would, so it gave local fighters and rum runners presumably an advantage to escape capture. 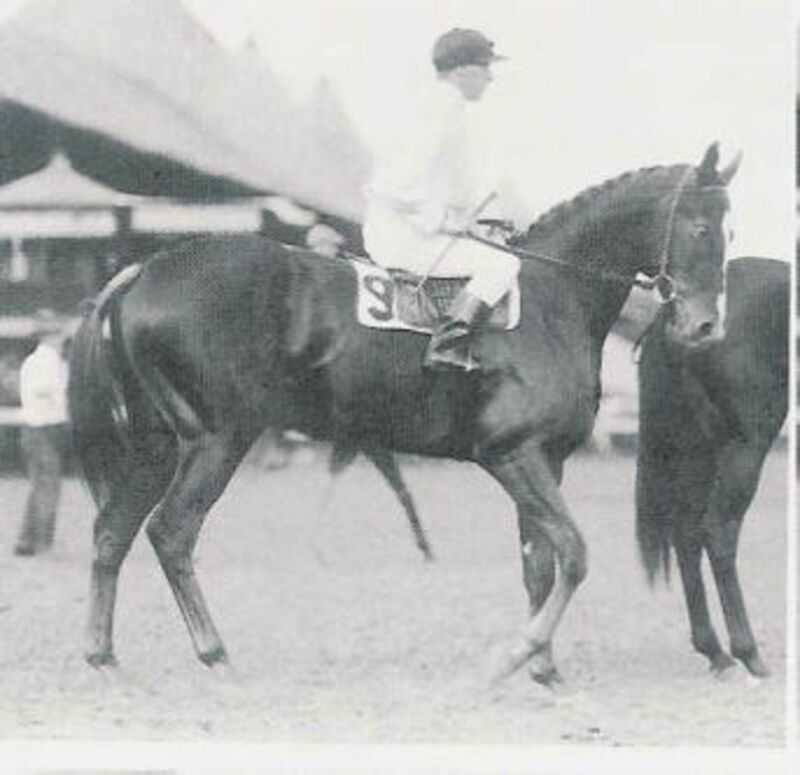 The name tacky derived from the British and meant cheap or common, but the horses are considered a rare breed today and nearly died out entirely. 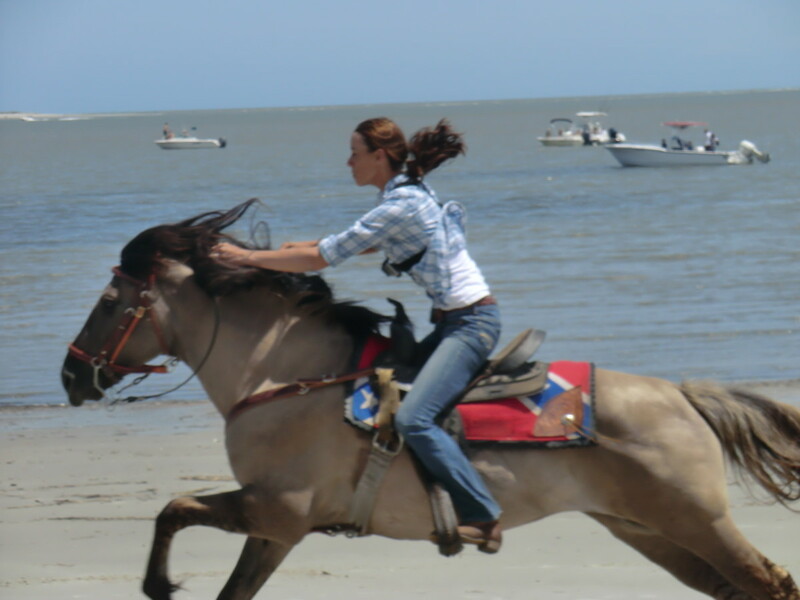 There are only about 300 remaining but owners are working to keep the breed alive and help promote the horse's versatility in events like the one today where the horses race along the beach. The colors of the horses here today range from clay-red dun to dark brown. The riders vary from late teens to late fifties. Both men and women are riding and some compete against each other. It is only the horses divided into breed categories! It is late April and the cool morning is met with a warming sun and a nice sea breeze to keep the dreaded biting sand gnats at bay. Two by two the horses line up along a stretch of the beach and are waved on by a starter who bravely stands between them. Some horses wait patiently to start. Others spin and turn and back up toward the ocean, threatening to dump their riders in the brink. There are a few glitches and a few spills, but mostly things run smoothly and the crowds are well pleased. 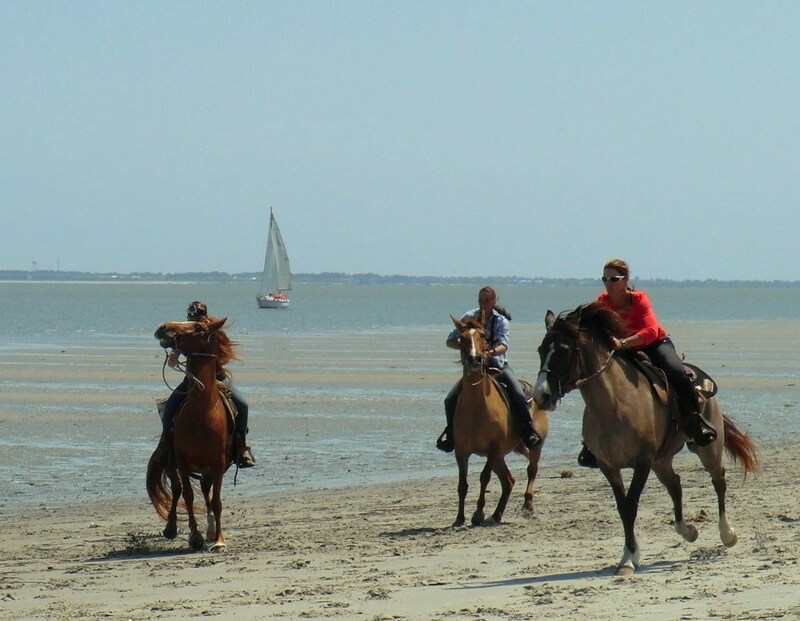 The horses' mostly bare feet slap the wet sands of the beach like riffle fire as they kick up a spray of powdered sand, clamped together with the salt water of the receding sea. A group of party goers on a pontoon, who are being eyed suspiciously by island security are now stranded for three hours until the tide changes. They appear to have more alcohol than sense. Several riders go out after their race and ride right up to the boats. The tides go out as rapidly as they come in, catching many boaters off guard and stuck until the waters return again on their six hour cycle of highs and lows. A few kayakers even brave the choppy waters to get an upfront view. Old school buses and golf carts carry visitors to and from the race area with a mass exodus of golf carts trying to leave at the same time and coming close to running over riders and guests. A local law enforcement agent says that people don't really think of golf cars like real cars so tend to drive and park wherever they feel like it, so cautions those on foot to be careful of where they are going. Almost every adult has a beer or wine-cooler in hand and talking excitedly about the after-party where more booze is sure to flow. For many family adventurers it is time to go back to the ferry and head for home. In the end there are many trophies and ribbons given out to various riders who won their heats or final race and everyone goes home happy knowing they have done their best and proud of their horses for having the heart, courage and stamina to compete. 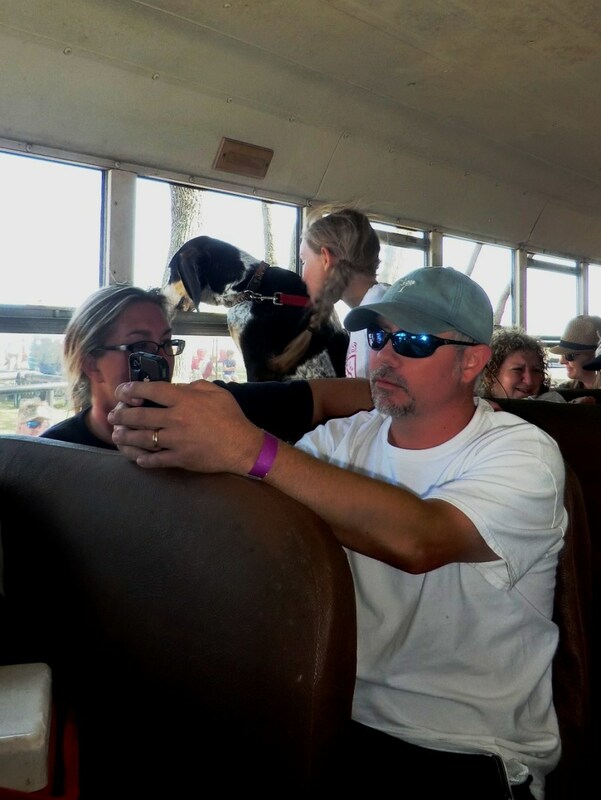 If you would like to learn more about Marsh Tacky's or Daufuskie Island, click on the links to each. Daufuskie is a fun place to explore, but you need to bring plenty of water and a good pair of walking shoes unless you have the near $100 to rent a golf cart that may or may not get you all the way around the island! Most of the carts are electric here and have a limited battery life before recharging. There are some expensive resorts that offer full-sized bath towels at pool-side and luxury service that would make you think you were royalty or you can rent a smaller cabin up near the water ferries and the restaurant and bring a bicycle to explore the many dirt and paved roads. It costs about $35 to rent a round-trip ferry or you can bring your own boat and pay a docking fee. 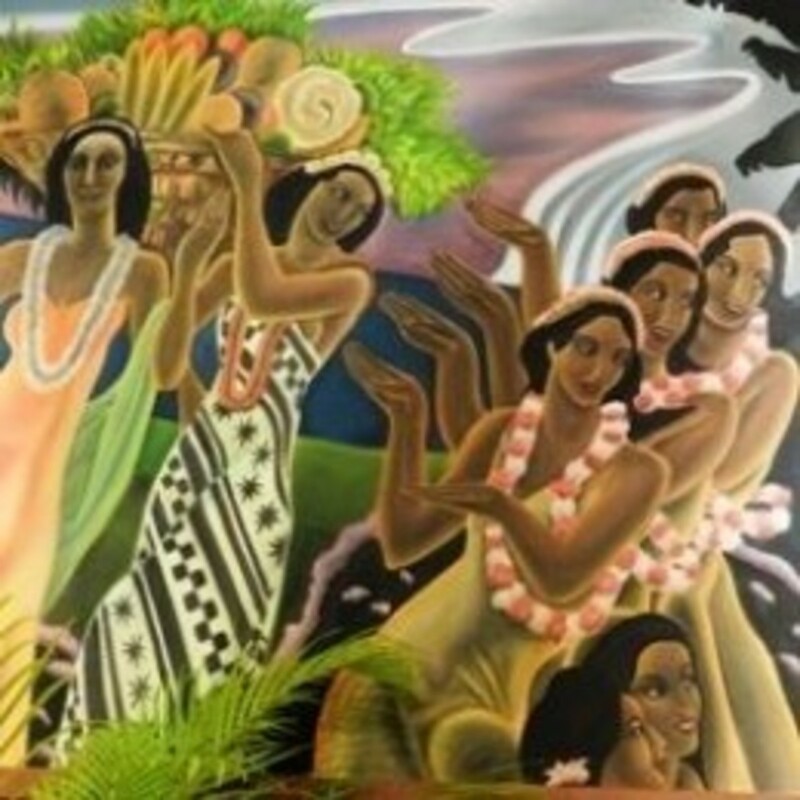 No matter how you get there or where or how long you stay, you really shouldn't miss the gem of an island that offers tranquility and a glimpse of a past that is quickly disappearing. Many of the roads on the tourist map are actually more like trails; often overgrown, but the natives are friendly and willing to point you back to where you need to be and many people even offer to stop and give you a ride to where you want to be. Visitors report seeing deer everywhere and even fox squirrels which used to be plentiful on the mainland until shopping malls and housing complexes led to their demise. 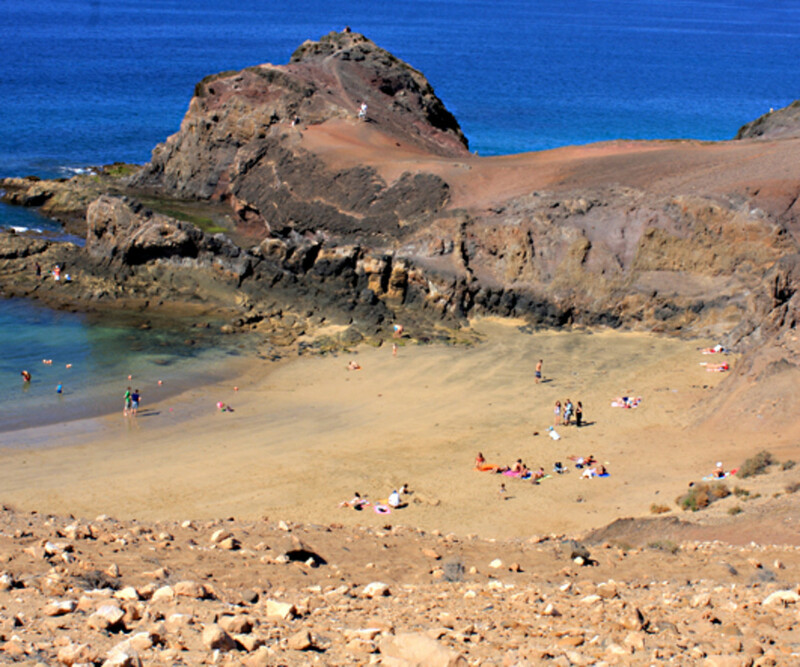 There is something for everyone, but you will do a lot of traveling if you explore the island on your own and food can be expensive, so if you are on a budget, bring a lunch or a snack and water just in case. Camargue horses! These are such bftuaieul photographs. I was quite horse-obsessed when I was younger, and I would devour 300-paged books on horse breeds. Unfortunately, I had to give up riding to focus on dance. 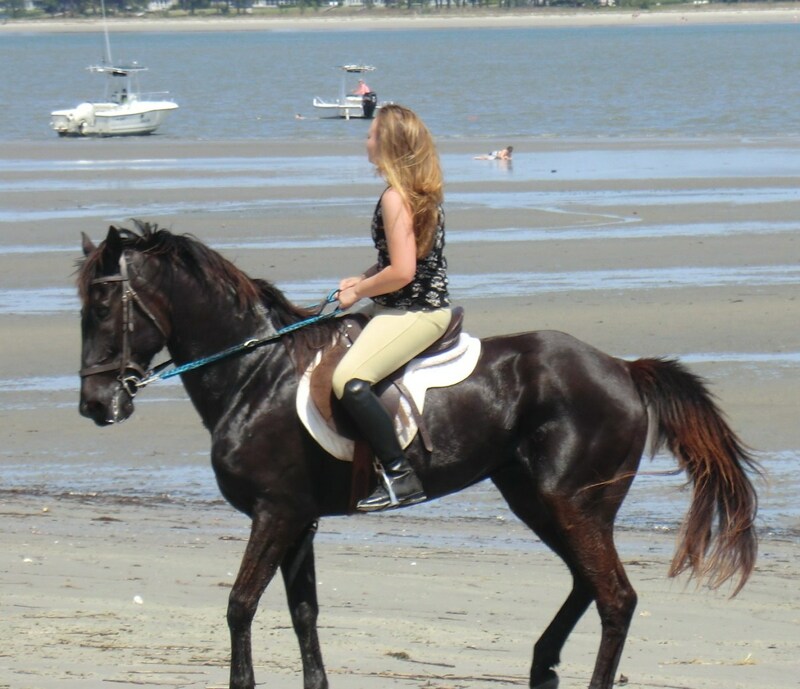 I haven't been riding in months, and I miss the smell, the feel, the grace of horses so much. okay, went back and did some editing to make it more user friendly now. Thanks for the feedback and would love to return to this event one day as a spectator. I didn't bruise my hip. I just fell. Thanks, I was not implying the younger horse was less impressive and the parrot mouth thing appears to be a breed feature in some and makes them look more quizzical, or "cute". I was very impressed with their hooves and coats that close to winter coats shedding and some of the riders were really impressive. Was totally amazed at how calm some of the horses were, especially the stallions. Would definitely rank this as a must see for horse lovers. Just wish the crowds were not so thick. Set my backpack down to mark my spot, and walked down the beach and came back and thirty people had moved in front of my spot and thrown their stuff on top of mine :-(, still good to see a big turnout for the event. 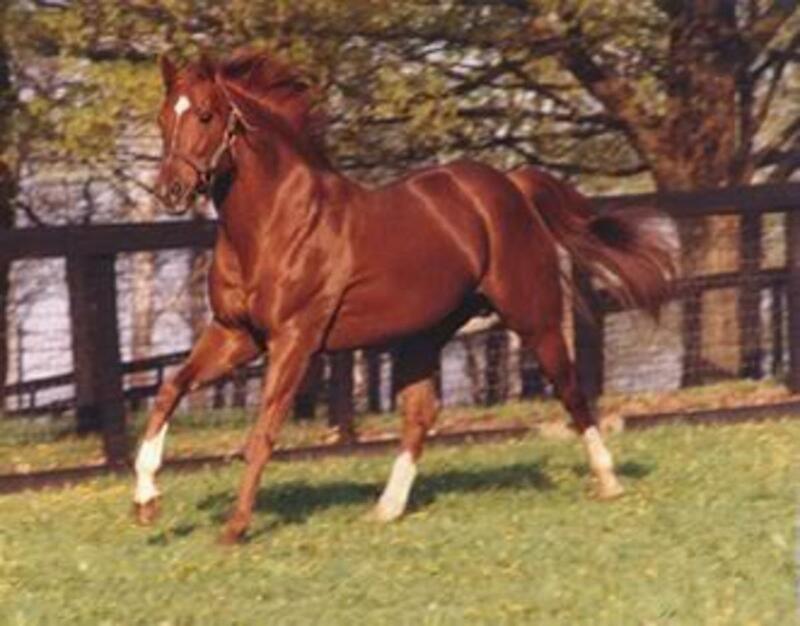 The name of the "less distinctive" stallion is Jack Friday. He shares his life with the Goodwin Family of Blackberry Ridge Horse Farm in Upstate South Carolina. He was born on Good Friday 2009 and is now the overall champion for the 5th Annual Marsh Tacky Beach Race. He is a stunning mahogany bay horse that gleams with no show sheen on him. He turns to a deep blood bay in winter months. He has an outstanding disposition, as do his foals. He was the best mannered horse there. 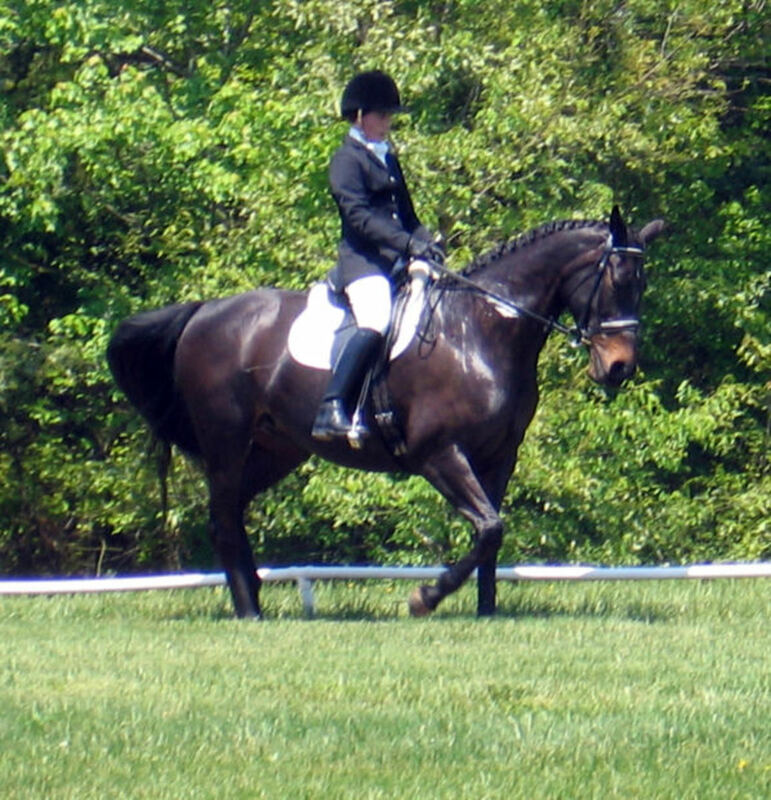 And his rider is classically trained and her riding form and training should satisfy any "purist." Additionally, Friday is the Southeast Reserve Champion for the American Indian Horse Registry. He won that title at age 3.